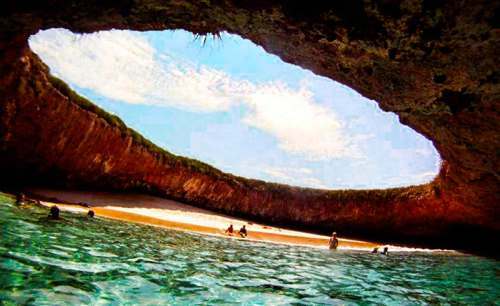 Mexico’s famed Hidden Beach (Playa Escondida), aka as the Beach of Love (Playa del Amor), has reopened for limited tourism following a three month closure for cleaning and restoration work. The beach is on one of the small, uninhabited Marieta Islands, in the Marieta Islands National Park, off the west coast of Mexico, and relatively close to the resort of Puerto Vallarta. It is one of Mexico’s most beautiful small beaches, looking from the air (image) like an “eye to the sky”. In earlier posts, we considered how Playa Escondida (“Hidden Beach”) was formed and also looked at the not inconsiderable downside to publicizing one of Mexico’s most beautiful beaches. After a study by University of Guadalajara researchers found that local coral was dying and argued that the beach could support no more than 625 visitors a day (compared to the estimated 2500 who visit it on vacation days), federal authorities closed the beach and prohibited access while they considered how best to regulate future visits. Mexico’s National Protected Areas Commission (Conanp) has now announced new regulations governing visits to the island and to the beach. It is limiting visitors to 116/day, well below the University of Guadalajara figure for carrying capacity of 625/day/. In addition, no single group may have more than 15 members. No diving is allowed. Fins, face masks and snorkels are all prohibited. Visits have a strict time limit of 30 minutes. The beach, visted by more than 125,000 in 2015, will be completely closed two days each week for maintenance and monitoring. Only time will tell if these measures will be sufficient to ensure that this particular gem of Mexico’s hundreds of amazing geosites will still be there for future generations to admire and appreciate. 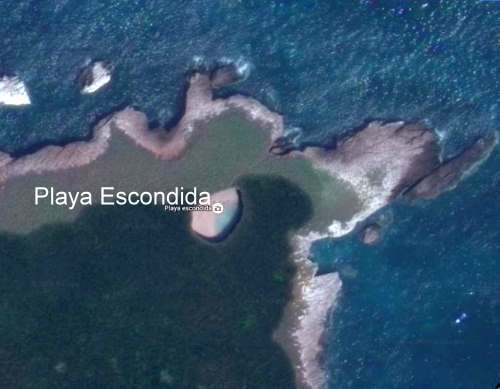 Other Comments Off on How was Playa Escondida (“Hidden Beach”) formed? Officials in Quintana Roo claim that beach replenishment in the state requires the investment of at least 500 million pesos (about 35 million dollars) in the next few years, and are asking for federal help. After Hurricane Wilma in 2005, many beaches in Quintana Roo were badly damaged. Following the hurricane, initial beach restoration efforts were funded by the federal Tourism Secretariat, with maintenance then passed over to local (municipal) authorities and the state government. The restoration program included the planting of more than 8,000 palm trees in an effort to help stabilize the coast. However, storms in late 2014 caused considerable damage to beaches, especially the Gaviota Azul beach in Punta Cancún, prompting tourism representatives to call for renewed investment in restoration. Quintana Roo has budgeted 5 million pesos in this year’s budget to complete the five Environmental Impact studies needed prior to applying for federal funding. Quintana Roo currently has only one Magic Town: Bacalar. The Tourism Secretariat has previously announced that it plans to add 17 towns to the list this year, bringing the total by year-end to 100. Towns that have applied for Magic Town status will be evaluated in June this year, with decisions expected to be announced in July. Given the number of towns submitting applications, some locations are clearly going to be disappointed in this round of nominations. 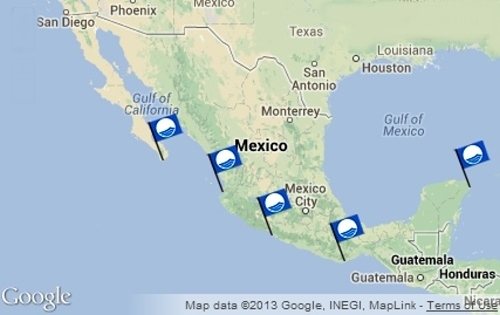 For the first time ever, five Mexican beaches have been awarded Blue Flag certification. The Blue Flag system is a voluntary, international eco-label program run by the non-government, non-profit organization the Foundation for Environmental Education that recognizes beaches where water quality is excellent, where information and environmental education is readily available, and which are well managed, with high standards of safety and services. The announcement was made in Copenhagen, Denmark, where Blue Flag certification was given to 3100 beaches and 625 marinas worldwide. What does the Blue Flag system take into account?